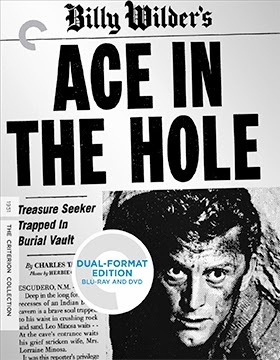 Upon its release, the dark, brilliant noir Ace in the Hole was a box office flop. In the years since, it has rightfully been lauded as an uncommonly prescient statement about the exploitation of a tragedy by the media. This release is a dual-format re-release of the 2007 Criterion edition of Ace, containing three discs (two DVD, one Blu-ray). The plot is uncommonly nasty, even for a noir drama: looking for the big story that will get him back to a big city and out of Albuquerque, N.M., enterprising newsman Chuck Tatum (Kirk Douglas, Paths of Glory) latches on to the tale of a man caught inside a mountain by a cave-in. Tatum guarantees himself exclusive access to the story by making shady deals with the local sheriff and the victim’s wife. He goes so far as to persuade the engineers working to get the man out to use an alternate method of excavation that will guarantee the tragedy lasts longer. 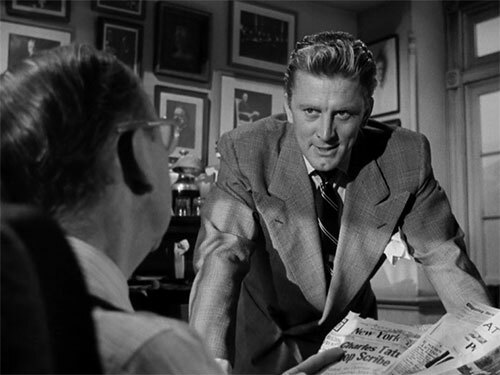 Filmmaker Billy Wilder (Sabrina) never shied away from having a heel as his protagonist, and Kirk Douglas’s Tatum is a consummate sleaze (until the third act, in which he does feel pangs of conscience). The notion of a newsman manipulating events wasn’t a new one, but Wilder and his co-scripters did it to a fine turn here, letting us know that Tatum’s business deals are literally killing a man. Kirk Douglas gets the scoop in Ace in the Hole. The critique of the American “entrepreneurial spirit” is spelled out beautifully in the scenes when a carnival, replete with a Ferris wheel, is built up around the site of the cave-in (thus the film’s alternate/TV title, The Big Carnival). Having jump-started the noir cycle with Double Indemnity and brilliantly mocked one of its main tenets (jaded voiceover narration) in Sunset Boulevard, here Wilder contributes one of the darkest visions of America in Fifties cinema (“noir in broad daylight,” as it is referred to by critic Molly Haskell in an essay included here). The supplements in this set shed a great deal of light on the production, Wilder’s working methods and his blissfully cynical attitude towards the movie business. Seen in a 1984 interview, Kirk Douglas speaks with nothing but admiration of working with Wilder. Spike Lee (Oldboy) offers an “afterword,” citing its realistic view of the “dangerous” side of the medium and compares it to the equally prescient Face in the Crowd. Wilder is heard from in a 1986 Q&A at the American Film Institute, where he addresses the three-act structure of his screenplays and discusses his avoidance of “fancy-schmancey” shots in his work. The most information-filled supplement is a French video documentary in which Positif editor Michel Ciment interviews Wilder in the early Eighties. Wilder talks about a broad array of topics, and his frequent stars Jack Lemmon and Walter Matthau also tell their favorite Wilder anecdotes. The filmmaker offers his memories of Vienna and Berlin between the wars, as well as his off-the-cuff opinions about colleagues like Marlene Dietrich (“a German hausfrau” who preferred housekeeping to glamour when offscreen). Wilder also offers the secrets of Alexander Trauner’s sublime production design for his films — as in The Apartment when the immensity of Lemmon’s office was achieved via matte paintings and little people in the distance, sitting at miniature desks.